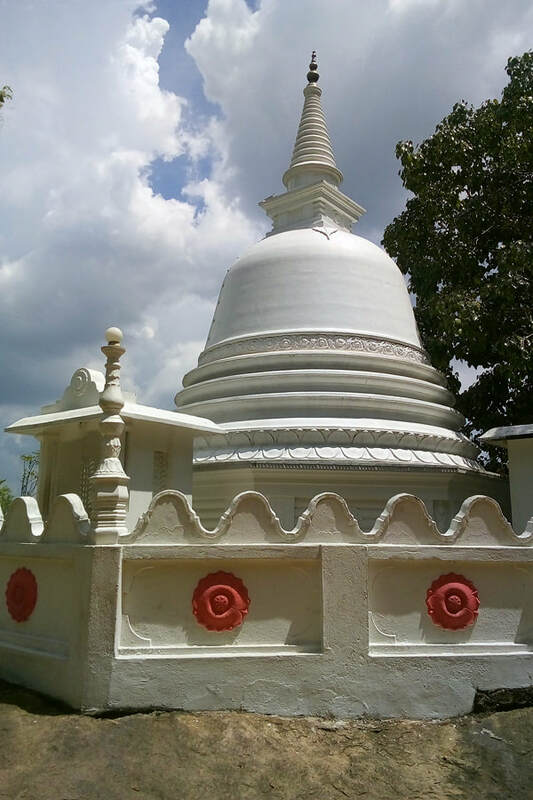 Varana Raja Maha Vihara, though not far away from the Colombo-Kandy road A1 and district capital Gampaha, is situated in a delightful tranquil green surrounding. 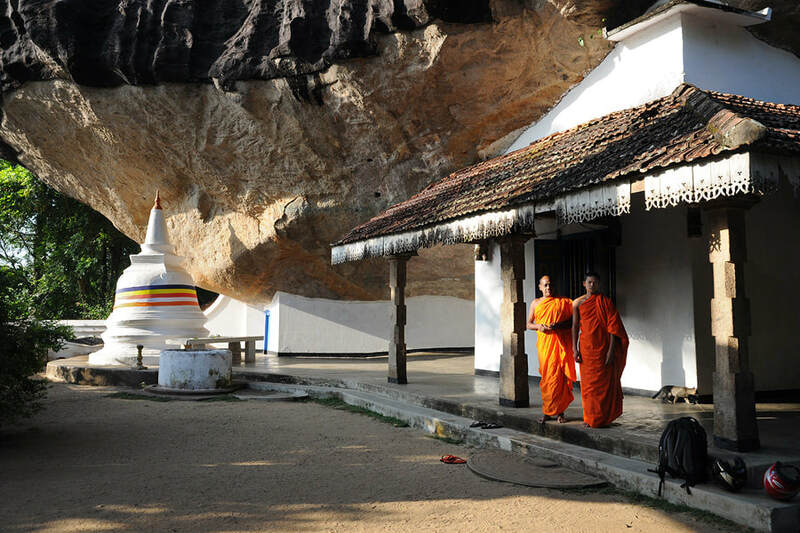 Surprisingly, this rarely visited classical Sinhalese cave temple is the largest forest monastery in the Western Province. The caves and buildings are grouped on three levels of a rocky hill. 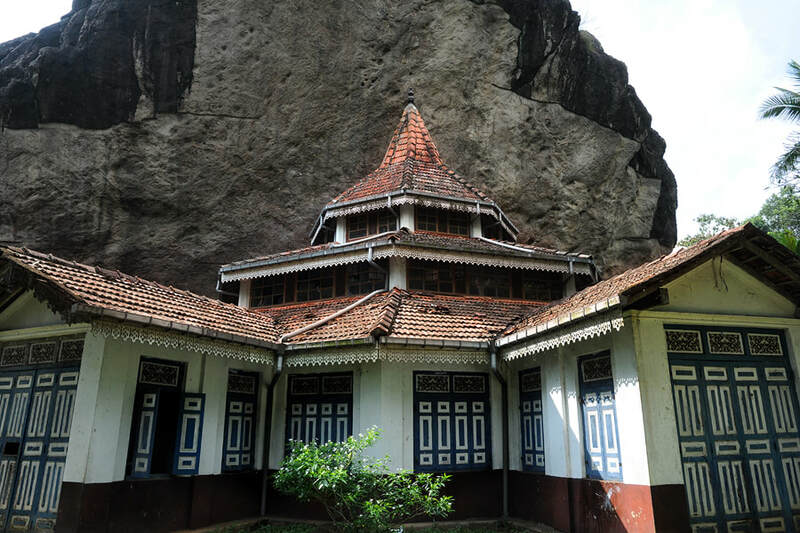 The modern monastery is on the ground level, the cave temples with statues and paintings in the Kandyan style are on the middle and upper terrace. They can be visited with the help of a monk or an assistant who has access to the keys. Visitors are still welcome, as until now there are not too many them. The Varana monastery is an undisturbed living heritage, not overcrowded at all. It's exactly that kind of attraction that heritage travellers are looking for - and will miss when travelling along the beaten track only. Varana Rajamaha Vihara, also transcribed Warana Raja Maha Viharaya, is an archaeological site located 11 km east of Gampaha and 3.5 km southeast of Kalagedihena, which is located at the Colombo-Kandy mainroad (A1), and 3 km south of Thihariya at the same mainroad, reachable via a the side road B416. 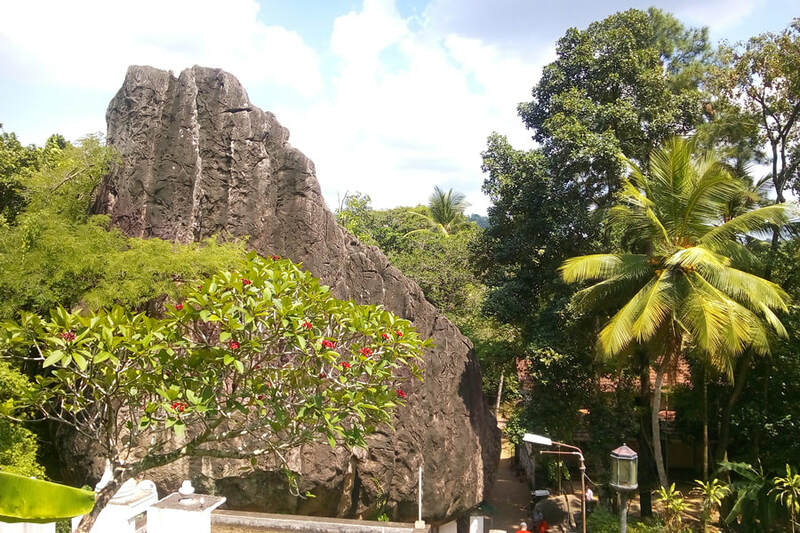 Varana, like many other cave temples of Sri Lanka, is situated within a group of rock outcrops, temples and monk cells being placed in natural rock shelters. The name is derived from “aranya”, meaning “forest”. The prefix “Va” could have been chosen as the name of a tree. The Varana temple is said to have been built in the very beginnings of Sri Lanka’s Buddhist period, during the reign of Anuradhapura’s first Buddhist king, Devanampiyathissa, in the 3rd century B.C. Renovation works are atttributed to famous kings such as Vatthagami Abhaya, also known as Valagamba, who reigned in the 1st century BC. Nissanka Malla, who reigned in Polonnaruwa in the late 12th century AD, and Parakramabahu VI, who was the most important king of the 15th century Kotte period, are credited with embellishments, too. Last not least, Kandy's famous restorer of Buddhism, Kirti Sri Rajasinha, was a supporter and maybe even reviver of the Varana monastery in the 18th century AD. 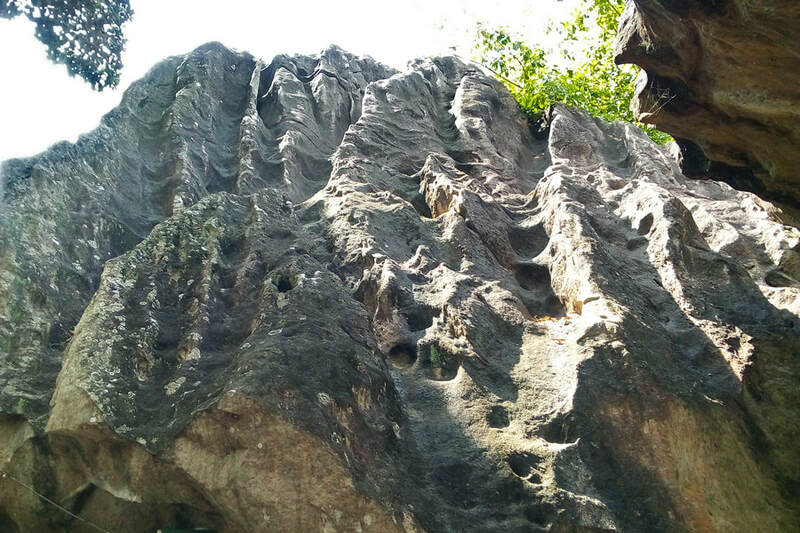 A drip-ledge inscription was dated back to the 3rd century BC, which is the earliest century of the island's Buddhist history. That donation inscription mentions the name of Tissa Dhatta, who is believed to have been the first pupil of Missionary Mahinda, who came from India. If this attribution is correct, Varana originally was the abode of an Arhat, an enlightened being. However, citations of monks’ names were very uncommon in the earliest Buddhist period. Such inscriptions are more common in AD centuries. 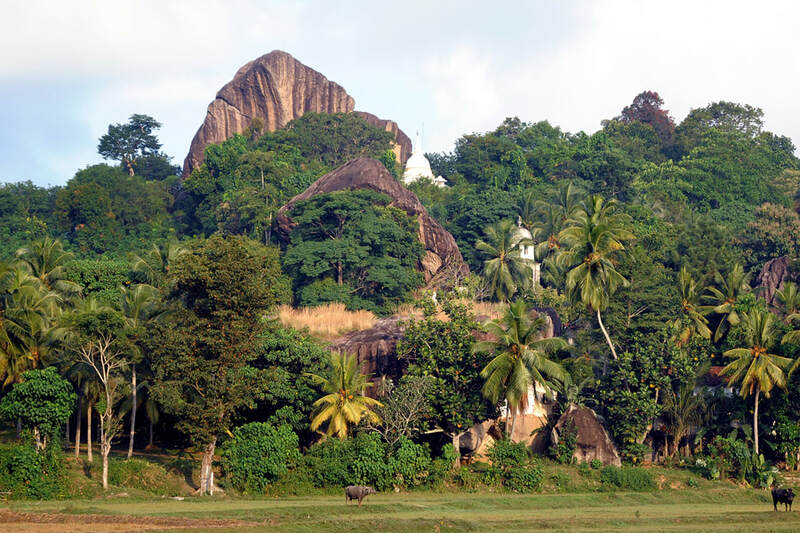 The three terraces on different levels mentioned above are known temple as Pahala Maluwa, Meda Maluwa and Ihala maluwa. 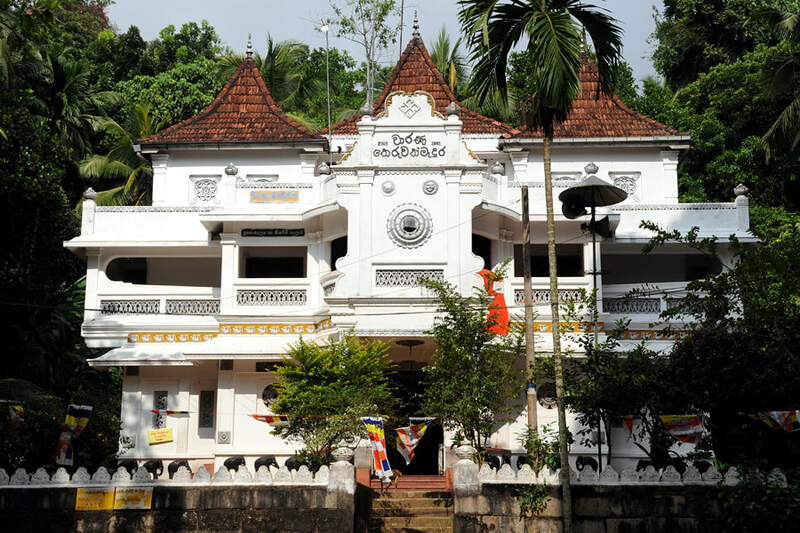 A modern multi-storey reception building (Sangawasaya), accommodations of monks (Kutis) and an octogonal preaching hall (Dharmasala) are on the ground level, forming the integral parts of today’s monastic life in Varana. 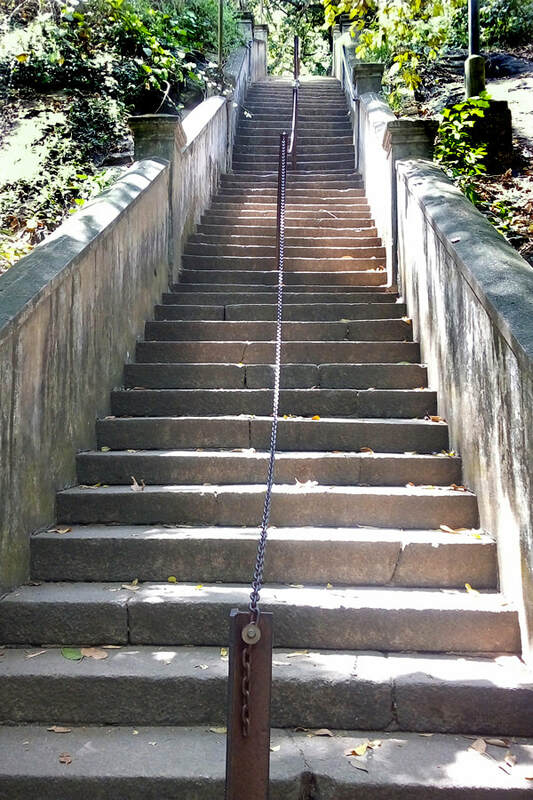 It takes around 50 steps to reach the the second level, the Meda Maluwa, which is also known as Meda Wiraya. At the right side of the stairway is a newly built pond full of fish. For travellers, the Middle Terrace or Meda Maluwa is the main attraction of the Varana temple. 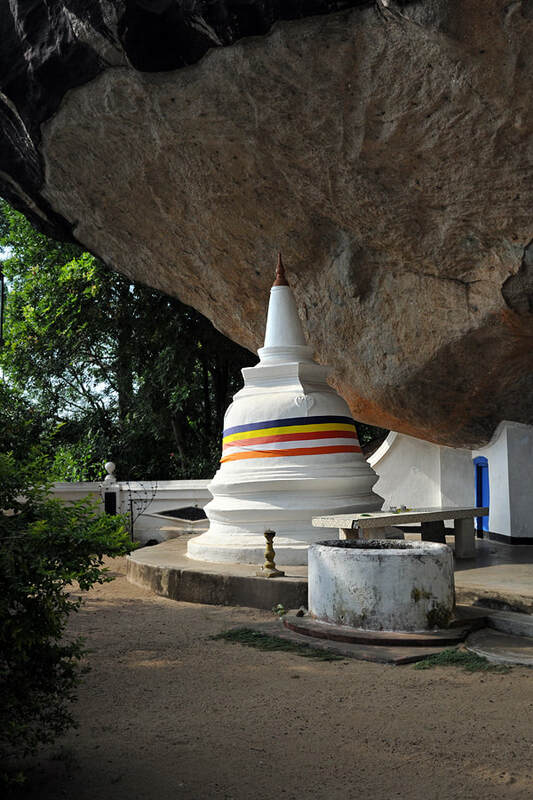 Just below an overhanging rock and in front of the cave temple, there is a small white-painted stupa. This brick dagaba dates back to the Polonnaruwa period and is atttributed to King Nissanka Malla, who visited Varana on one of his many journeys. 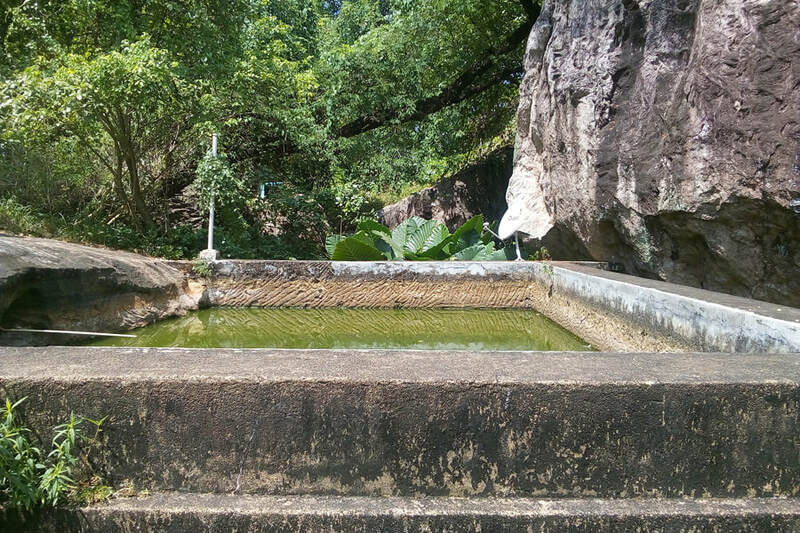 A moonstone in front of the cave temple seems to be in the Anuradhapura style, but is actually from the modern era. 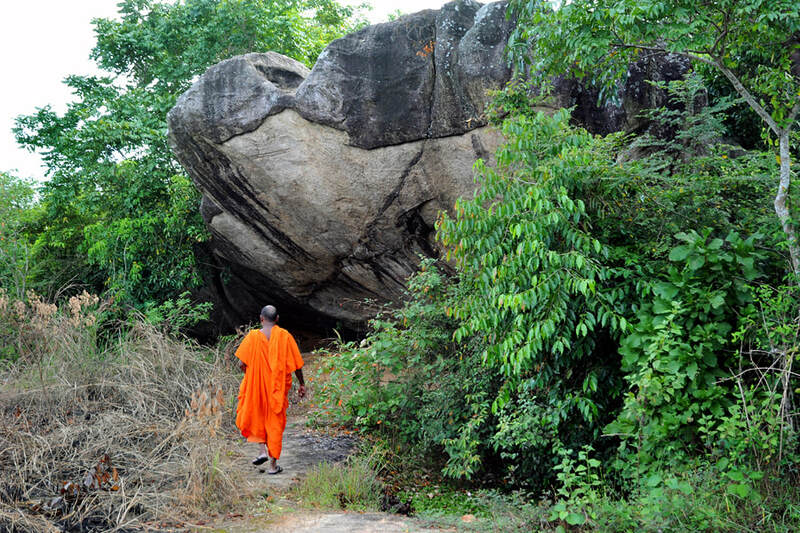 The first cave temple of the Meda Maluwa shelters the largest reclining Buddha of Varana Rajamaha Vihara. 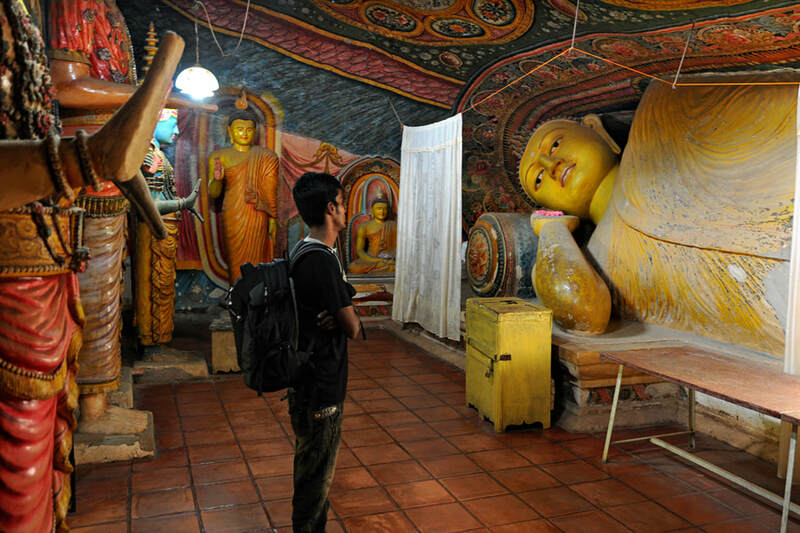 Local tradition attributes this 5.5 m long recumbent Buddha to King Nissanka Malla. But it's more commonly attributed to King Parakramabahu VI, who reigned in Kotte, Sri Lanka’s first capital in the western plains. By the way, Colombo' suburb Kotte is today's official capital of Sri Lanka. The late medieval Kotte kingdom seems to have developed Varana as one of the main monasteries of this period (15th century), as it was situated in the hinterland of the capital. Parakramabahu VI issued a royal edict donating paddy cutivation areas for the maintenance of the Buddhist order. It is said that the king and his consort came personally to offer the first flowers to a newly erected Buddha image in Varana. The second cave of the Meda Maluwa is even larger than the first one. 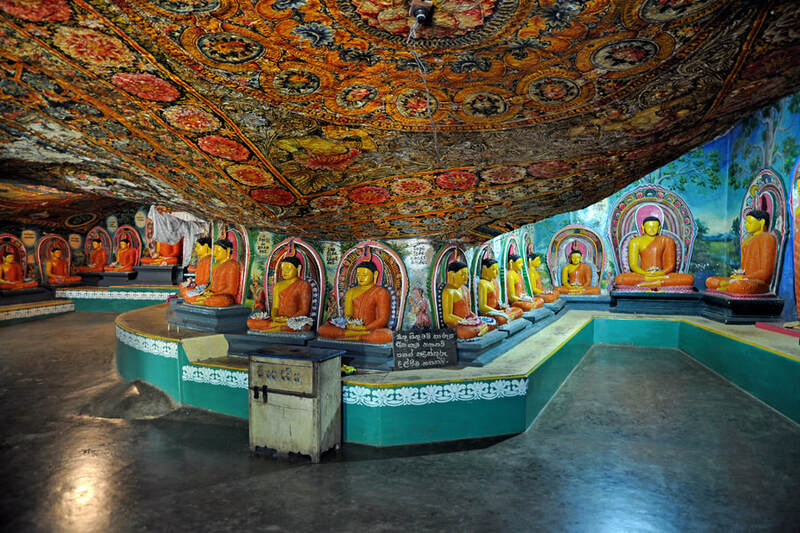 The main cave temple is decorated with numerous Buddha statues and paintings. 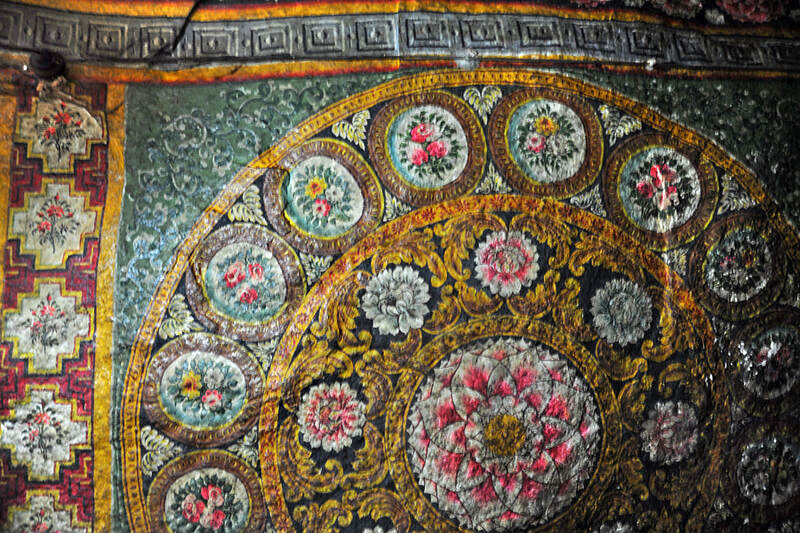 The murals of the canopy of this cave depict the typical lotus flowers of the Kandyan period. All paintings were obviously restored in the 20th century. 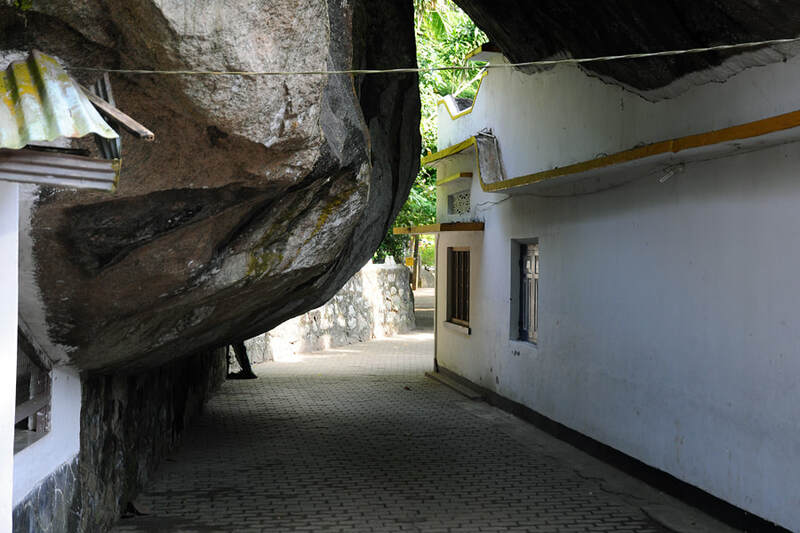 The U-shape of this cave temple and its row of Buddha statues is unique in Sri Lanka. 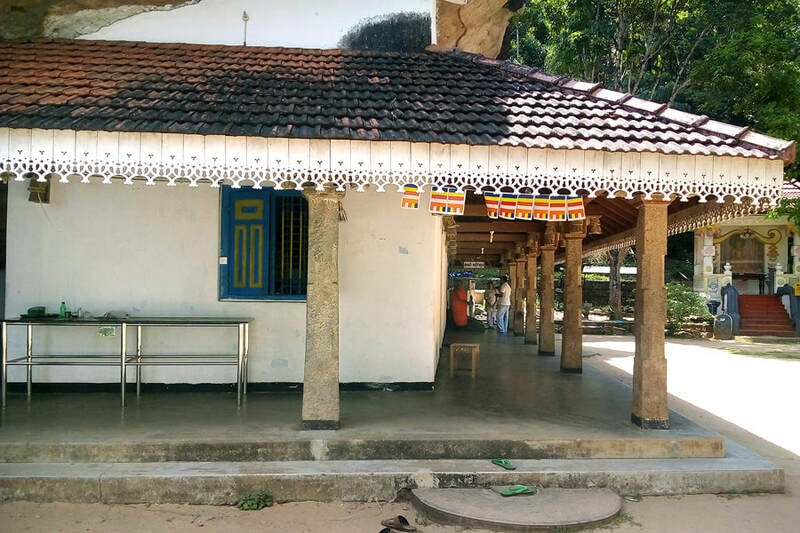 Although the interior in the Kandyan style is from the modern era, it is highly likely that this comparatively large rock shelter was inhabited by monks already during the Anuradhapura period. Many previously inhabited caves were later on transformed into image houses, which are actually temples with Buddha statues venerated by pilgrims. A steep stairway of 150 more steps leads to the upper terrace of the Varana Rajamaha Vihara, where another ancient stupa and another Kandyan cave temple can be seen. 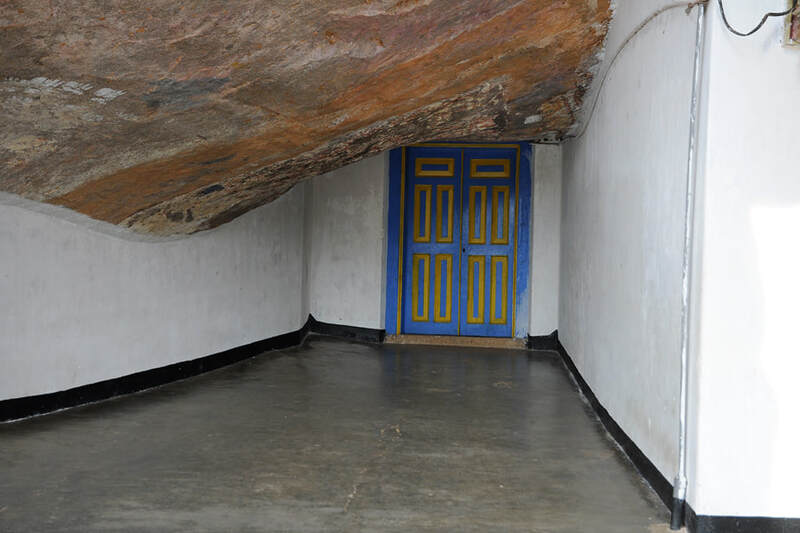 The main cave of this upper terrace shelters the second largest recumbent Buddha of this rock monastery. Altogether 12 caves are near the summit of this ridge of Varana. 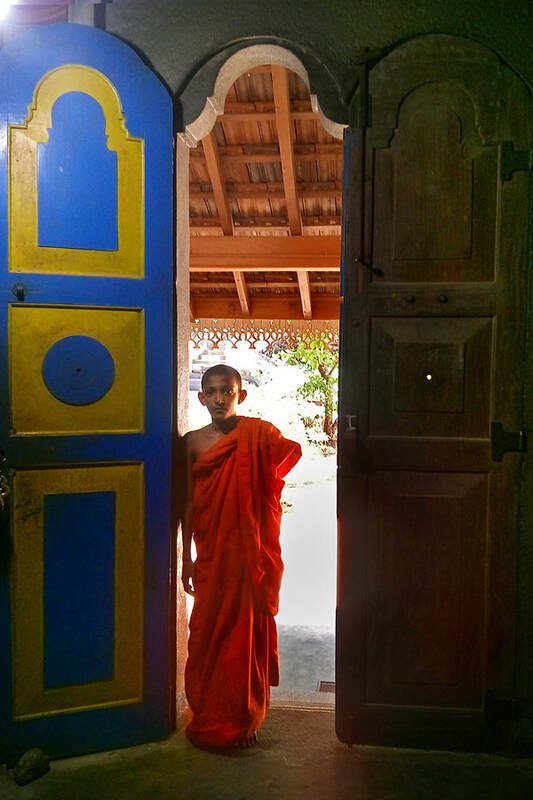 Some of them have walls and front doors and still serve as monks’ dwellings, so-called Kutis. 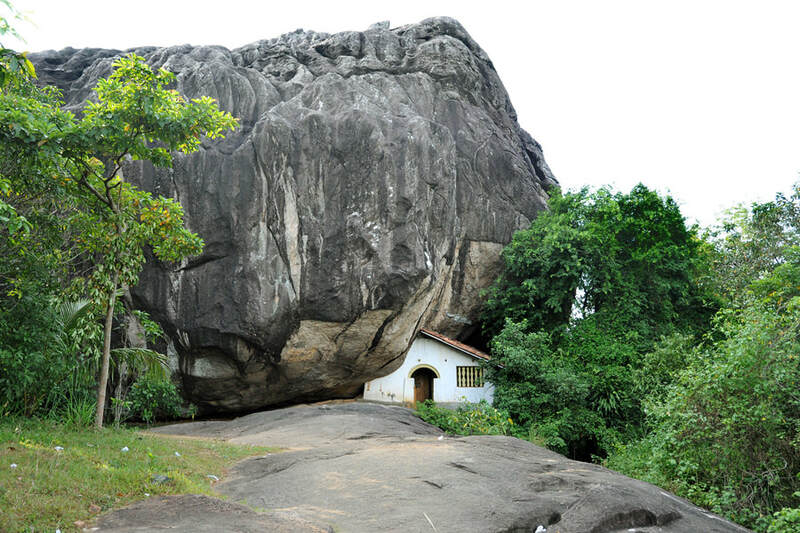 Others are rock shelter which have not been transformed into image houses or cells in the Kandyan period. 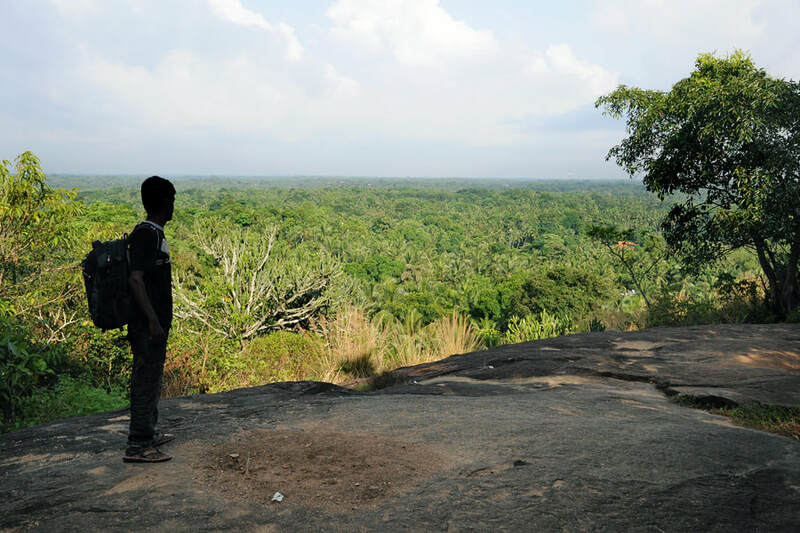 They can be found at the opposite side of the peak, which is a great vantage point, with views to the green plains of Gampaha District. 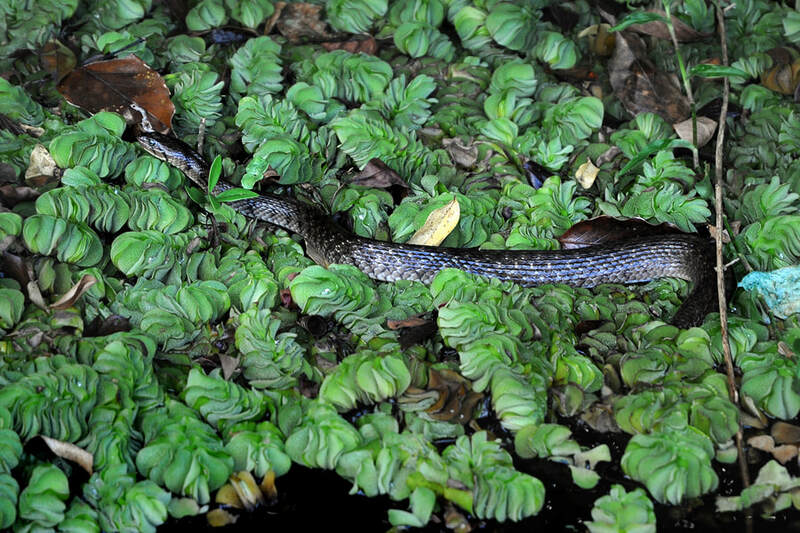 One natural rock shelter, a little bit hidden in the jungle, is said to have been the refuge of King Valagamba – or rather one of his many hiding places. "Valagamba", also transcribed "Walagambha", is the Sinhalese name of the important Buddhist king whose name is "Vattagamani Abhaya" in the island chronicle written in Pali language. 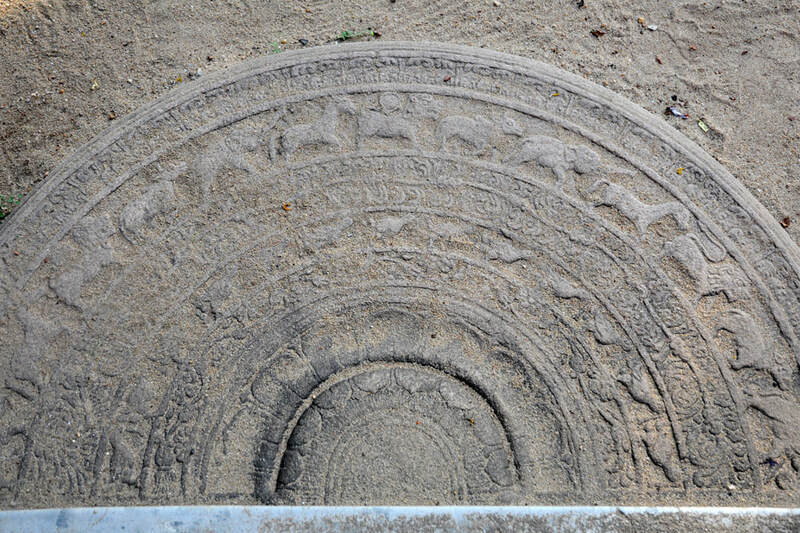 When Valagamba, who had to flee from Anuradhapura due to a Tamil invasion from mainland India, succeeded in recapturing his kingdom and capital Anuradhapura, in a gesture of gratitude, he donated Buddhist temples at all those caves that had served as his hiding places during his years in exile, including the Varana Rajamaha Viharaya. 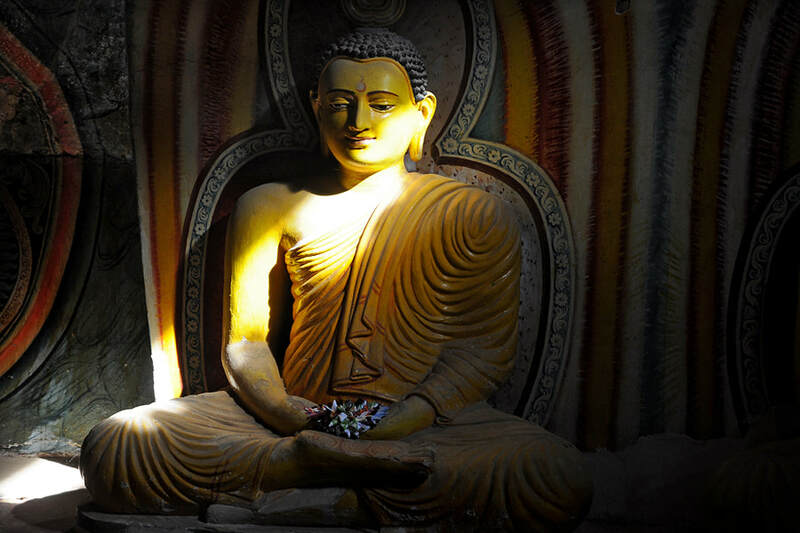 Local legend also has it, that he (instead of Nissanka Malla or Parakramabahu VI) placed the Buddha statue in the largest cave, which would mean, that Buddha statues existed in Sri Lanka much earlier than in India, which is historically unlikely. 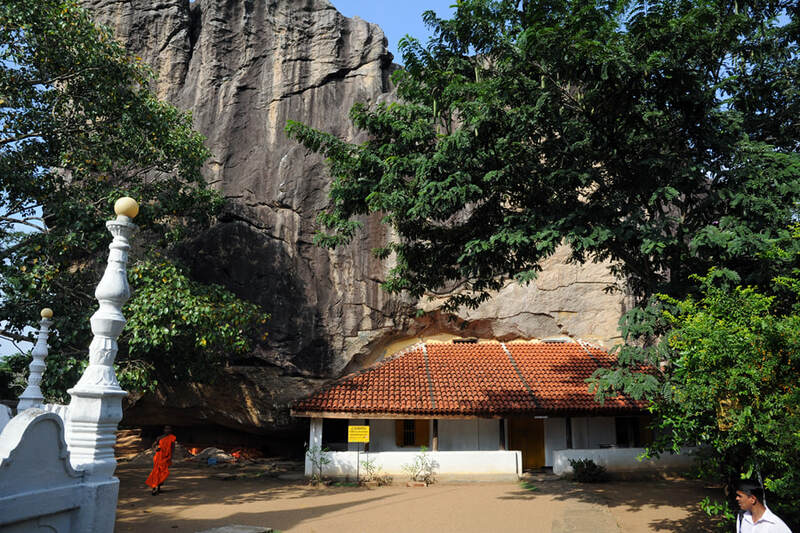 The Varana Rajamaha Vihara is one of the five ancient sites of the historical landscape called Siyane Korale. Though not far away from Colombo, this ensemble of charming cave temples in the lush green setting of Sri Lanka's tropical wetzone plains, the Siyane Korale temples are extremely rarely visited by foreign tourists and also unknown to many inhabitants of the Western province. It's a perfect day trip from the dusty and noisy capital. The other four places of interest in the Siyane Korale are Maligatenna, Pilikuttuwa, Koskandawala, and the spectacular logan of Pettagangala. All of them are situated in less than 8 km distance from Varana.